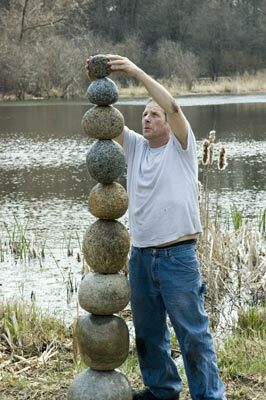 Jim Needham ("The Rockstacker™") is a towering figure among rock balancers and stone stackers world-wide. His extensive website (regularly updated) demonstrates an inspired, vigorous body of work informed by his academic studies (MFA, SF Art Institute) and his personal, spiritual, and artistic dedication. 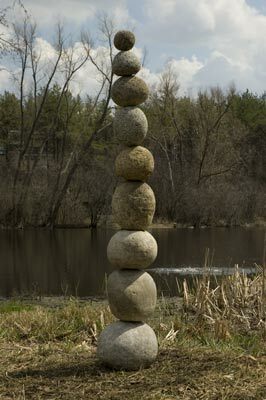 Blessed with an unique vision, he has disciplined his approach to his work in a manner exemplified by the phrase (his) "One With the Stone". His over a dozen years of effort have culminated in his public Gravity Garden near Monterey, California, although he explains that he does most of his work in private. To him, "The photographs are the documents, the art, not the balancing itself." Self-made Giclée prints are available of many of his pieces. >> See Jim's video on Youtube.com. Well aware of the risk of "taking oneself too seriously or not seriously enough", Jim has developed an articulate concept of the metaphors through which and within which he participates in the divine. 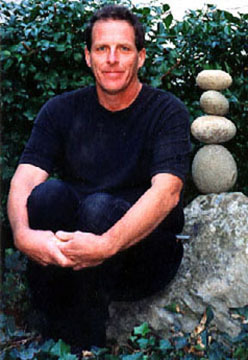 The heading image on this page is a portion of his photograph of an altar at his Mended Hoop Campsite, where he "gathered his Allies", and made new sculptures. It is reproduced here in abbreviated form with his kind (though reluctant) permission.